‘Pilaf’ or ‘Pulao’ is a type of rice preparation commonly cooked across Indian, Central and South Asian, Middle Eastern, East African, Latin American and Caribbean cuisines. Though there are different names and plenty of recipes of pulao, basically it is prepared with long grain, fragrant rice along with seasoning like ‘Garam Masala’ or any other native spices depending on where it is prepared. This recipe is simple and subtle in taste. 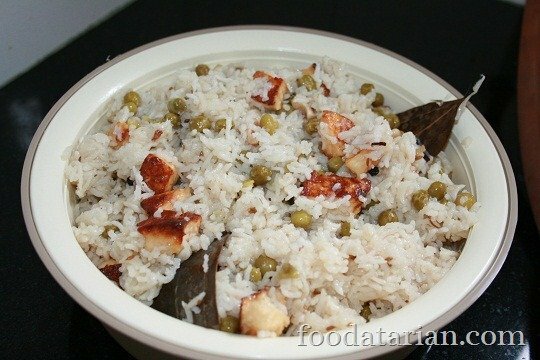 We have used Basmati Long Grain rice, whole garam masala, green peas and paneer or cottage cheese. Heat ghee in pressure cooker on a medium flame. Add all the ingredients of whole garam masala and sauté for half a minute. Then add sliced onion and sauté until translucent. Then add peas ans sauté for 3-4 minutes. Drain rice and add to the pressure cooker. Roast for a minute or two. Then add paneer cubes, water, salt and cashew nuts. Give it a nice stir, cover with the lid and pressure cook up to 1-2 whistles. Remove from flame and let the pressure drop completely. Then transfer to a serving bowl and serve hot with dal or any gravy, papad and pickle.